Today, we would like to present you with an effective exercise for your abdomen area. 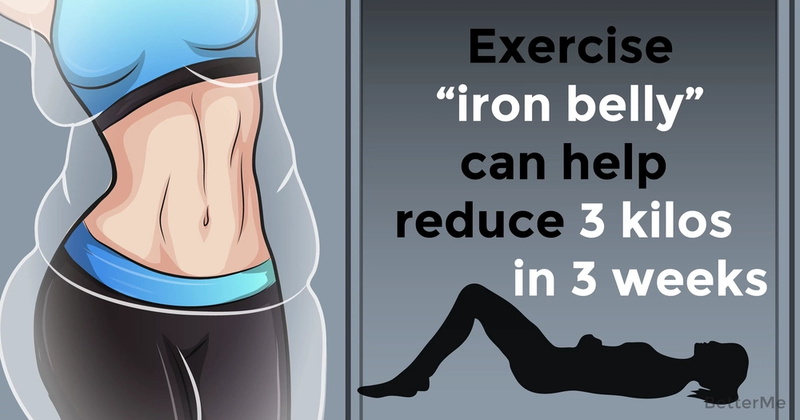 This exercise is called “iron belly” and it can help you lose 3 kilos in 3 weeks. The technique of this exercise is often used in yoga workouts. The “iron belly” exercise is designed for women who want to strengthen outer abdominals, reduce waist size, and get a flat stomach. With the help of our exercise, you can achieve your goal in a short period of 3 to 4 weeks. What’s more, you have to perform “iron belly” exercise at least five times a day. This simple breathing exercise is the best option to get rid of muffin top and reduce your waist size. If done correctly, a combination of breathing and muscle-strength exercises could rival complex abdominal workouts! What’s more, if you want to speed up results, you need to stick to a healthy diet. Try to eat well-balanced meals that are full of fruits and vegetables, protein and a few complex carbs. Also, you need to drink plenty of water to keep your body hydrated. If you are not a water lover, you can try to drink cucumber and lemon water. Are you ready to perform our “iron belly” exercise? Put on a sports uniform and turn on your headphones. Let’s do it!